Each year, in the United States, about 70% of the energy produced is wasted as heat. The temperature of most part of that heat - which is emitted from large industrial processes, cars, or computers - is less than 100 °C. 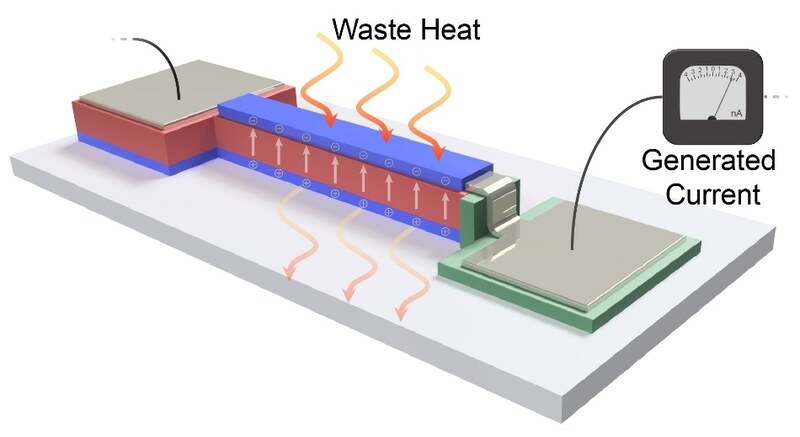 At present, engineers from the University of California, Berkeley, have designed a thin-film system that can be fitted to such sources of waste heat to generate energy at levels never before achieved for this type of technology. In this thin-film system, a method known as pyroelectric energy conversion is adopted. The new research of the engineers has demonstrated this method to be appropriate for exploiting waste-heat energy supplies below 100 °C, or low-quality waste heat. Pyroelectric energy conversion, similar to various systems that transform heat into energy, functions optimally with thermodynamic cycles, analogous to the functioning of a car engine. However, in contrast to the engine of a car, pyroelectric energy conversion can be completely achieved in the solid state without moving any parts when waste heat is converted into electricity. The latest outcomes imply that this nanoscopic thin-film technology could be, in specific, attractive for installation on and tapping waste heat from high-speed electronics. However, it can also have a wide array of applications. When it comes to fluctuating heat sources, the research indicates that the thin film can convert waste heat into usable energy with higher power density, energy density, and efficiency levels when compared to other forms of pyroelectric energy conversion. We know we need new energy sources, but we also need to do better at utilizing the energy we already have. These thin films can help us squeeze more energy than we do today out of every source of energy. The study was reported in the Nature Materials journal on April 16, 2018. This study was partially supported by grants from the Army Research Office and the National Science Foundation. Although pyroelectric behavior has been well-known for a long time, accurate measurement of the characteristics of thin-film versions of pyroelectric systems has been very difficult. An important contribution of this new research is to expose that process and improve the knowledge of pyroelectric physics. Martin and his team produced thin-film versions of materials with a thickness of only 50–100 nm. Then, the team collaborated with Dames, associate professor of mechanical engineering at Berkeley, and his team to create and test the pyroelectric-device structures based on these films. These structures enable the team to concurrently measure the temperature and the generated electrical currents, as well as the source heat to test the power generation capabilities of the device—all these are performed on a film with a thickness less than 100 nm. By creating a thin-film device, we can get the heat into and out of this system quickly, allowing us to access pyroelectric power at unprecedented levels for heat sources that fluctuate over time. All we’re doing is sourcing heat and applying electric fields to this system, and we can extract energy. This research shows new records for pyroelectric energy conversion: power density of 526 Watts per cubic centimeter, energy density of 1.06 Joules per cubic centimeter, and efficiency that is 19% of Carnot efficiency—the standard unit of measurement for the efficiency of a heat engine. The following stages in this line of study will be to better enhance the thin-film materials to particular waste heat temperatures and streams. “Part of what we’re trying to do is create a protocol that allows us to push the extremes of pyroelectric materials so that you can give me a waste-heat stream and I can get you a material optimized to address your problems,” Martin added.